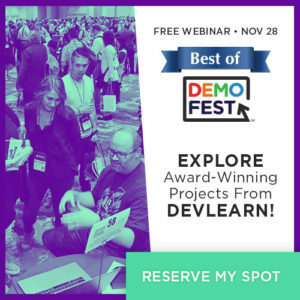 Explore the winning projects from DemoFest, an attendee-favorite event from DevLearn Conference & Expo, which took place last month in Las Vegas. This eLearning Guild webinar showcases some of the award-winning learning projects presented during DemoFest at DevLearn 2018 Conference & Expo, now available to all through this special online presentation. Meet several of this year’s winners in the complimentary Best of DemoFest Webinar on Wednesday, November 28 at 10:00 AM PT. Register now to learn about the award-winning projects in the following categories and get some great ideas to apply to your work!